I have the Katy Perry “T-G-I-F” chanting in my mind today. Anyone else glad it’s Friday? I definitely don’t have those kinds of plans for the weekend, but I am itching to get out of the house for a while. I’m also excited about getting to meet my baby niece on Sunday (I’m a great aunt now, but let’s just stick with aunt!). I was flipping through May’s Style at Home magazine earlier this week and came across a cute porcelain berry basket from Crate and Barrel that I definitely need to check out. Purchasing through affiliate links in this post may mean I’ll earn a small commission at no extra cost to you. See my blog policies here. You may remember the brightly coloured farmer’s market baskets I showed you from Anthropologie a couple months ago. As fabulous as they are, they come with a price tag of around $20 each. A bit steep, wouldn’t you say? This comparable one from Crate and Barrel for around the same size is about $8, which I think is a little more manageable. 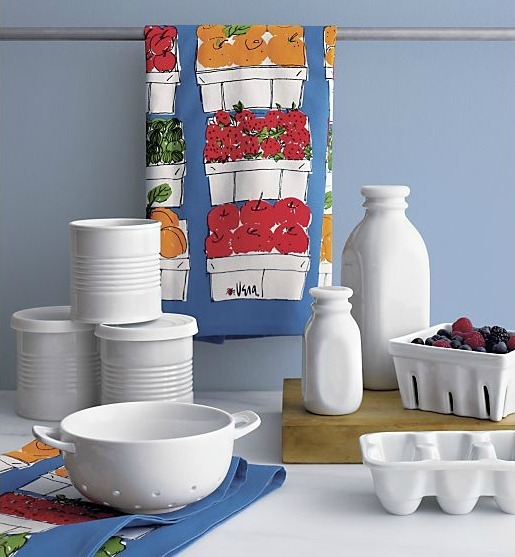 I also love the matching milk bottle, egg crate, storage containers, and colander. If white is what you’re looking for, this one is a great alternative. Plus, once you add your fruit or veggies, you’ll get the pop of colour you may be looking for. Love a good deal! Found any of your own lately? So cute! Off to the mall. I will have to check them out! 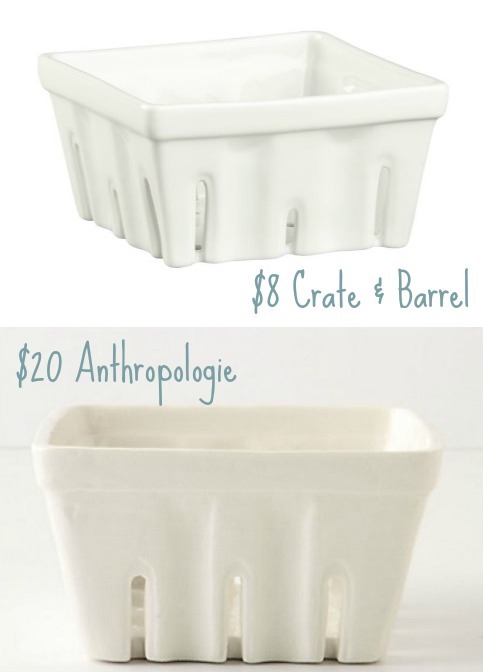 I love these little baskets and almost bought them from anthropology when you last posted them. I searched around and also found a cheaper alternative at Sur La Table. Maybe I will just head over to crate and barrel and skip on the shipping….. I love all the white! Makes me think I should spray paint everything in my home white…well…that might be a bit much, but surely some of it? It looks wonderful! I love those baskets. I found some at Homegoods, too. I don’t remember the price, but I know they were cheaper than the Anthropologie ones! I wish I could say TGIF, but I have to work this weekend. Ugh! On the bright side, it’s shaping up to be a light weekend. Fingers crossed! How exciting to meet your new niece. Have a great weekend! cute! especially since C&B is WAY closer to home than Anthropologie. I do have to say though that as much as I like white, it would be nice if they were in some bright colours like Anthro had. Yes, the colored ones are so cheery! Oh wow I love the white! 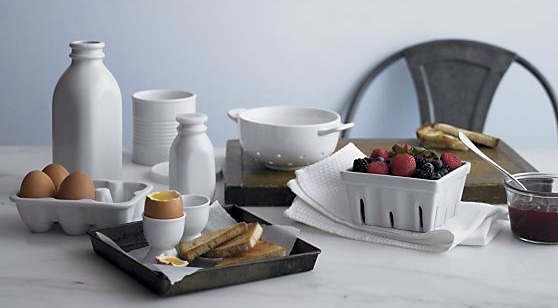 I have a white dish fetish… we don’t have a crate and barrel here in Ottawa… hmmmm, maybe on-line! Have fun baby squishing and congrats Auntie Shauna! Thanks Laurie. Really looking forward to holding her! These are really gorgeous. You can’t go wrong with white. Sadly my cupboards are full! Maybe it’s time for a little spring cleaning to make some space for a new goodie or 2! Oh my goodness… those are super cute!!!! Thanks for sharing them! Hi, Do you know who makes the jugs and lidded jar in the photo? Thank you! Hi Marie, They’re from Crate & Barrel.